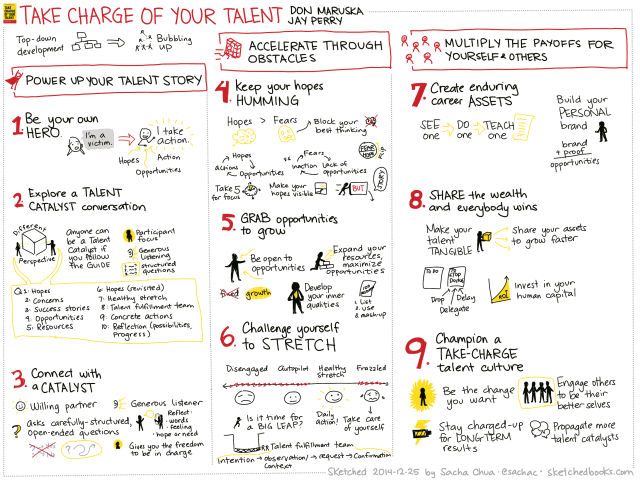 Don Maruska and Jay Perry’s Take Charge of Your Talent: Three Keys to Thriving in Your Career, Organization, and Life (2013) has plenty of tips for developing your skills and taking charge of your career. I’ve sketched the key points of the book below to make it easier to remember and share. Click on the image for a larger version that you can print if you want. I liked the chapter on reflecting on your talents through a structured conversation with someone who can reflect back not only your words but also your feelings and hopes. Sometimes we don’t see the patterns in our thoughts until someone points it out to us. The questions are also good for personal reflection, and I’m looking forward to using them in my planning. Sometimes people ask me to help them figure out what they want to do. Other books I’ve read about coaching tend to be pretty high-level, but this one gives concrete advice, including some notes anticipating potential responses or difficulties. I also liked the chapters on creating tangible assets and sharing them with other people. That’s been a great learning- and career-booster for me, and I hope other people will try it out as well. Among other things, the book also suggests listing at least one hundred resources (people, places, things, skills, …). Forced-length lists are great for creativity because you dig deeper than your surface answers, often coming across surprises. When you review your list, think about ways that you could make even better use of those resources. The book also suggests taking a look at your top 10 resources and working towards 100% use of them, which will be an interesting challenge. The third related exercise is to combine different resources so that you can break through obstacles or come up with interesting mash-ups – forced association, another great creativity technique. I like this reminder to apply creativity so that you can recognize and make the most of your resources, which allows you to MacGyver your way to growth. Want the book? You can buy it from Amazon (affiliate link) or check out their website at .